Windows Media Player is a native multimedia player that is available in all versions of Windows that Microsoft supports. While Microsoft did create special editions for use in the European Union and some other regions that come without it by default, it is fair to say that the player is available on the vast majority of Windows systems. Windows Media Player supports only select media formats by default. It supports audio formats such as mp3, wav, or wmv, and a selection of video formats as well. The multimedia player refuses to play any format that it does not support; that is different from players such as VLC Media Player or AIMP that play a gazillion formats out of the box. WMP Tag Plus is an extension for Windows Media Player that adds support for several new formats to the multimedia player. Support in this context means that Windows Media Player integrate files with the new extensions into its libraries and supports tagging. Playback support is not added, however and needs to be added through other means. The plugin for Windows Media Player adds support for the following extensions after installation: ape, fla, flac, m4a, m4p, mpc, oga, ogg, and wv. As far as supported formats are concerned, support is added for the following: Monkey's Audio, FLAC, Musepack, MPEG-4, Vorbis, and WavPack. All formats come with read, write and tag support. 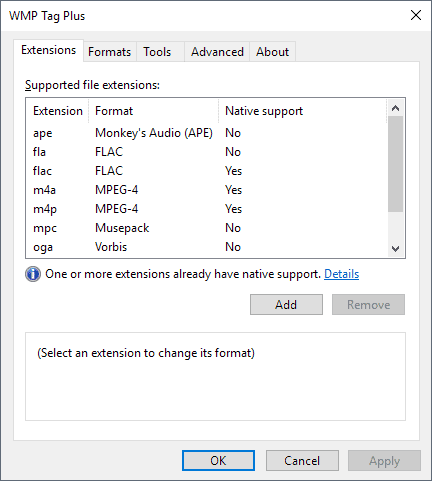 The WMP Tag Plus options launch automatically on first start of Windows Media Player after installation and you will notice that Windows Media Player refreshes the libraries on first start as well thanks to support for new file formats. Select Tools > Plugins > Options from the main menu bar of Windows Media Player. Switch to the Background category on the Plug-ins page. Select WMP Tag Plus and then Properties. The plugin detects if extensions have native support already, for instance through installation of codec packs, and won't interfere with the integration. You can disable formats on the formats tab; the only reason you may want to do so is if you run into playback issues with a format that you can't resolve. The Tools tab gives you an option to refresh song tags. Doing so will refresh tags of all songs and add the music to the library based on those tags. The program preserves existing tags and the developer notes that using the feature is only necessary if you added music files in formats that WMP Tag Plus adds to Windows Media Player prior to installation of the plugin or when the plugin was disabled. WMP Tag Plus is a useful plugin for Windows users who work with Windows Media Player. The plugin extends capabilities of the media player. Check out the developer's other Windows Media Player plugin, Windows Media Player Plus, which adds tag editing and other functionality to the player. Now You: which media player do you use and why? does it support Groove music for windows 10? i have problem for ape format. i installed K-Lite Codec Pack but it didn’t work. You installed K-Lite CODEC pack. You should have MPC (Media Player Classic). It supports APE and many other formats. No argument there. Just pointing out that what’s installed is able to support so many CODECs. No, WMP Tag Plus only works in WMP. Groove Music isn’t supported. I used K-Lite codec pack when I was a Windows user, until MS ruined WMP’s gui by making it “modern.” Then I switched to MPC-BE. Now that I use Linux, my media player is SMPlayer. Windows Media Player? LOL! Uninstall that garbage and get aimp or other media players! LAV Filters is all you need, maybe Haali Media splitter. Nothing wrong with WMP, in fact its awesome. Stick with good codecs for encoding. Foobar is an excellent audio player and handles rare formats, I use it for conversion/tagging too. MPC-BE is the goto for everything else. madVR can clean up old stuff. I use Foobar because people told me that it was the way to go with flac (and flac it has to be if one is into real music, that is classical music). But Foobar is a nerd product with no entry point for normal users, as soon as you want to rev it up. So I haven’t found a proper replacement for it. MusicBee Portable for libraries, MPC-HC by default. I am no expert re media, but the power, efficiency, and huge amount of customization possible with AIMP have made it my favorite for years. I have tried many other players from time to time, and always (so far) return to AIMP. I use MPC, obviously with K-Lite Codecs. Unfortunately MPC has never been able to read the ogg tags, but plays the files as expected. Anybody using this extension know if this enables WMP to ready the ogg tags? Thanks Tim. Now if we can get the same thing for MPC, all would be good in the world. Thanks I have corrected this.